Indiana State University student Kayla Holscher pondered what sort of creation she would invent as part of her semester long simulated business class when her professor discussed some troubles previous students had encountered with adhesives. That was when an unexpected image hopped into Holscher's mind: her children's rabbit. The pet died last summer, and Holscher's children wanted to create a memorial from a huge stone that they would decorate. "They saved fancy marbles and gems, and they thought they would put her name in it," Holscher said, "but they didn't know how to attach them." Holscher took the opportunity to solve the duo of dilemmas befallen her children and Alister McLeod, assistant professor of applied engineering technology management. 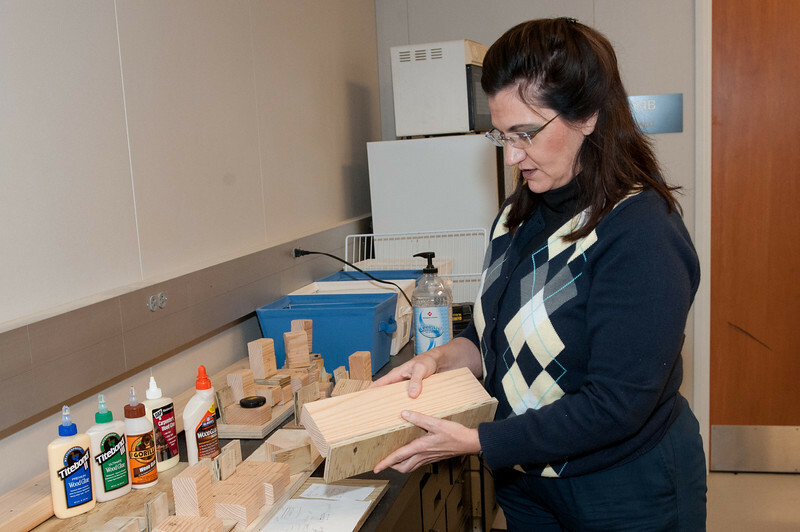 Rather than creating and marketing a project as most students do in the simulated company (SIMCO) course, she devoted her efforts to researching adhesives and determining the glues that work best on different construction materials, such as wood and plastics. 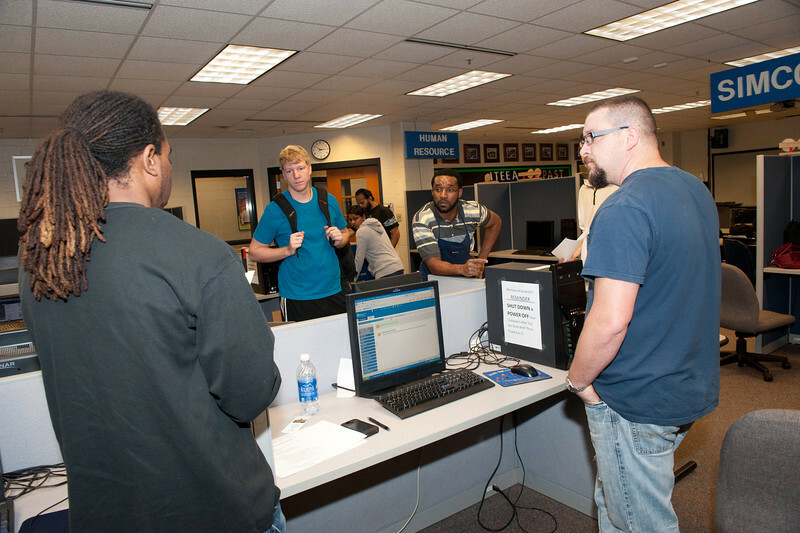 In the SIMCO course, technology students work in groups to create and pitch a product to McLeod, who acts as the project's financier. Once he approves a product, the student teams then design, troubleshoot, market and ultimately sell the product to make a profit. "The SIMCO lab is neat because it pulls all aspects of real life together, your product development, your marketing, the business aspect and quality," Holscher said. "My job is that I'm troubleshooting a quality issue that had come forth previously, and that's part of real business. You have to deal with things happening, such as customer complaints." Several groups created different products. One group created and sold more than a half-dozen plexiglass clocks illuminated by LED lights, while another group created sold protective iPhone covers featuring custom designs group members created. The SIMCO class also branched out this year, McLeod said, by having several students including Holscher analyze previous projects with the goal of improving future creations. On one project created in the last few years, a large piece of wood had fallen off of its frame, which prompted the analysis of the adhesive that was used to join the wood to the frame. "We have products that have been built over the past year, and now we're in a position to review some of those products and see what maybe some of the flaws associated with these products," McLeod said. Some projects also advanced on some innovations from previous semesters. A SIMCO team last year created several LED signs that sold quickly. The new team utilized a similar design to create clocks out of plexiglass. 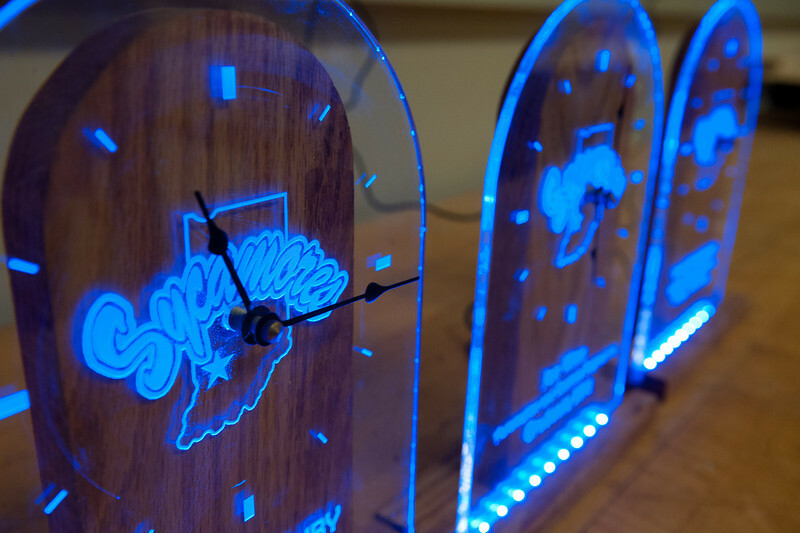 The LED lights illuminate the Indiana State logos and clock faces etched on the clocks. After conceiving the idea, the group worked its way through several prototypes before deciding on the final version. The group did not have to work nearly as hard to sell the creation. "It was very easy. We just went to people and said ‘this is what we're making' and showed them our prototype, and they liked it," said junior Mary Jones, a technology management major from Clinton. "We sold them pretty quickly. We sold three of them in the first day." The group ultimately sold seven clocks, the most they were permitted to make given the class schedule for the semester. The team also donated $150 of the profits to the Breast Cancer Research Foundation. "It was the breast cancer awareness month, October, when we were doing this," said Jones, who said that it inspired the group to determine the organization where they would donate the money. Another project also included a new development in a SIMCO initiative after a group of students created custom designs on iPhone covers. "Nearly everybody you talk to has some form of Apple product," said sophomore Travis Clymer, an advanced manufacturing major from Terre Haute, "so we just thought we would jump into that market." Their idea caught on - and quickly. 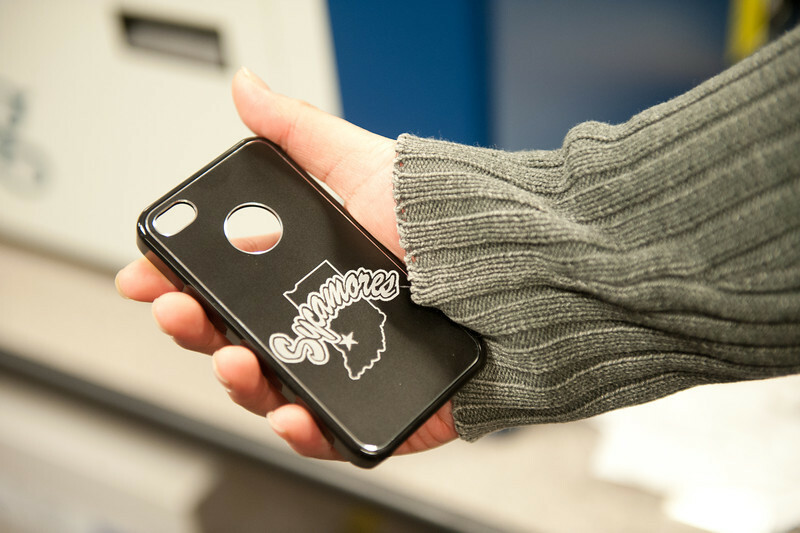 They initially created iPhone covers that featured an Indiana State logo, though they also received orders from different fraternities and sororities on campus. The team forged a partnership to sell the iPhone covers. One of the group members had a friend in the Scott College of Business who helps run the Executive Express Café in Federal Hall. The group running the café was considering adding retail items to the café, said David Robinson, co-director of Sycamore Student Ventures and professor of the group that operates Executive Express. Robinson talked with McLeod and learned more about the SIMCO class. Robinson's group worked with the SIMCO students, putting the iPhone covers for sale in the café. "There's a gap in what our students know about manufacturing, and there's a gap in the manufacturing students' not knowing enough about business or retail," Robinson said, "and I thought that was a recipe for collaboration, and Professor McLeod was thinking that same way too." The collaboration worked well, with Executive Express selling about 10 iPhone cases. In all, nearly 50 iPhone covers were sold during the semester, far exceeding the SIMCO group's expectations, Clymer said. The project was not without trial and error. Group members had to experiment with the etching equipment to properly be able to create a design on the iPhone cases from one of their suppliers. The troubleshooting is just one intended aspect that students encounter in the SIMCO course. "We've had to play multiple roles due to the class size, so I'm the quality manager, as well as the safety manager," Clymer said, "With the quality management, you get to see many of the problems that go on with every job within the company." Most SIMCO groups typically make and sell less than 10 products to ensure that the course does not lose money on excessive materials if the products do not sell, McLeod said. He does not spend much time teaching SIMCO students about marketing, which is more in line with the Scott College team that partnered with the iPhone case group. "We‘re not savvy about customer requirements, and that's why some of our projects have been hit and miss," McLeod said. "It would be nice if in the future we could work with this class to look at product design. During our design phase, we could get some feedback on what they think this product would mean to them, and what they could use it for." Photo: http://isuphoto.smugmug.com/Other/ISUphotoservices/SIMCO-lab/i-jkZLMb5/0/L/SIMCO_lab-7485-L.jpg (ISU/Rachel Keyes)LED clocks that were created and sold as part of a project in the simulated company (SIMCO) class this fall at Indiana State University. The group of students that created and sold the clocks donated half of the profits to the Breast Cancer Research Foundation. Photo: http://isuphoto.smugmug.com/Other/ISUphotoservices/SIMCO-lab/i-XLQ6WNL/0/L/SIMCO_lab-7454-L.jpg (ISU/Rachel Keyes)Indiana State University student Kayla Holscher tests an adhesive in the simulated company (SIMCO) course. She researched and tested different adhesives to help determine which ones work best on different products. The information can be used by future classes when they create different products. Photo: http://isuphoto.smugmug.com/Other/ISUphotoservices/SIMCO-lab/i-4d3xtxX/0/L/SIMCO_lab-7550-L.jpg (ISU/Rachel Keyes)A close-up of one of the iPhone cases with a design added in the SIMCO class. The group of students creating different designs for the iPhone cases partnered with a group of students in the Scott College of Business to market the products. They sold nearly 50 iPhone cases. Photo: http://isuphoto.smugmug.com/Other/ISUphotoservices/SIMCO-lab/i-wJB2DMp/0/L/SIMCO_lab-7489-L.jpg (ISU/Rachel Keyes)Indiana State University professor Alister McLeod, second from right, talks to several students in the simulated company (SIMCO) class. Students in the class create and market their creations as if in a business setting. Several student groups in the SIMCO class created different projects, including one that generated revenue for charity and one that yielded a new collaboration with Scott College of Business students.